The Somerville Mathematics Fund acknowledges winners of MathCad Software from Math Soft Engineering & Education, Inc.and scholarship winners. 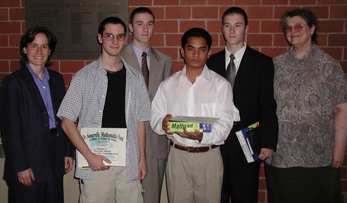 The scholarship winners are Christopher Magnell, Michael Favaloro, Siddhartha Jha, and Richard Facaloro. Each of these students is recognized for his/her outstanding work in mathematics while students at Somerville High School. All are planning on pursuing mathematics-related majors in college. In the photo on the above: (left to right) Beth Porter, Christopher Magnell, Michael Favaloro, Siddhartha Jha, Richard Facaloro and Erica Voollich. The Somerville Mathematics Fund acknowledges winners of MathCad Software from Math Soft Engineering & Education, Inc. They are Kathleen Bohan, Arshan Gailus, Ming Gao, and Jens Stevens. Each of these students is recognized for his/her outstanding work in mathematics while students at Somerville High School. All are planning on pursuing mathematics-related majors in college. The selecting committee was disappointed that the Somerville Mathematics Fund did not have sufficient funds to award scholarships to all four of software winners. 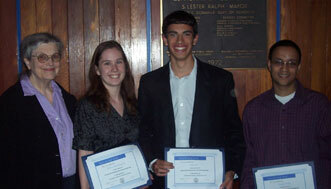 The Somerville Mathematics Fund's renewable mathematics scholarship winners were chosen by a selection committee. The two scholarship winners are Arshan Gailu, who will attend the Massachusetts Institute of Technology and Ming Gao, who will attend Brandeis University. At the awards ceremony at Somerville High School, Fund President Erica Voolich commented on how these scholarships are a result of numerous people making contributions. In 1990, eleven of the contributors to these scholarships traveled to China to meet women in mathematics, and this year they endowed a scholarship in honor of that trip. Keeping up with our winners click here for Ming Gao. The Somerville Mathematics Fund is pleased to announce the winners of their renewable college mathematics scholarships. The selection committee was pleased with the outstanding applicants; the community of Somerville should be proud of the achievements in mathematics of their top students. At the Somerville High School awards night, Erica Voolich, president of The Somerville Mathematics Fund, noted that this year’s winners have done much to celebrate, not only have they done outstanding work in challenging mathematics courses, they have done such things outside of class as representing the school on the mathematics team, independent physics research in Ireland, winning science awards, volunteering at The Math Fund’s family mathematics night to celebrate Pi Day, and/or participating in sports. 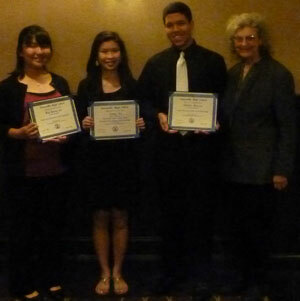 The winners of this year’s scholarships are Kyle Baxter, Lisandra Costiner, and Daipan Lee. All three of the scholarship winners are planning to attend MIT in the fall. This year’s finalists were Eric Gaudet and Michael Oshima. MathSoft Engineering & Education, Inc. of Cambridge was pleased to be able to award all five of the scholarship winners and finalists a copy of MathCad software in acknowledgment of their outstanding work in mathematics. All are planning on pursuing mathematics or mathematics-related major in college. 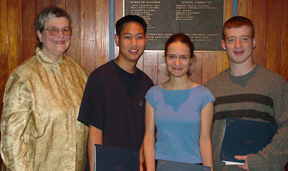 In photo above: From left to right: Erica Voolich, Daipan Lee, Lia Costiner, Kyle Baxter. Daipan Lee reports back. Click here. The Somerville Mathematics Fund is pleased to announce the winners of their renewable college mathematics scholarships. The selection committee was pleased with the outstanding applicants; the community of Somerville should be proud of the achievements in mathematics of their top students. At the Somerville High School awards night, Erica Voolich, president of The Somerville Mathematics Fund, noted that this years winners and finalist have much to celebrate in their classwork and they have belied the stereotypes for mathematics students: for anyone who thinks that women cant do math or that athletes are dumb, should take a look at these outstanding mathematics students who we have been reading about in the sports pages. The winners of this years scholarships are Monica Fernandes, Kathlyn Harris, and Xufang Zou. Fernandes will be attending Suffolk University; Harris, Colby College; and Zou, Brandeis University. This years finalist was Kara Rosetti. MathSoft Engineering & Education, Inc. of Cambridge was pleased to be able to award all four of the scholarship winners and finalist a copy of MathCad software in acknowledgment of their outstanding work in mathematics. All are planning on pursuing mathematics or a mathematics-related major in college. The winners of this year’s scholarships are Jeffrey Arredondo, Jessica Tse, Tri Vu, Xueyi Yu. Arredondo and Yu will be attending Northeastern University; Tse, Wellesley College; and Vu, Brandeis University. This year’s finalists were Kara Rosetti of Stonehill College and Ratawon Chaisilwattana of Matignon High School. MathSoft Engineering & Education, Inc. of Cambridge was pleased to be able to award all six of the scholarship winners and finalists a copy of MathCad software in acknowledgment of their outstanding work in mathematics. All are planning on pursuing mathematics or a mathematics-related major in college. The winners who received scholarship and MathCad software are Jarrett Arredondo, from Somerville HS, will attend WPI (mechanical or chemical engineering), Simon Davidson-Weiss from Somerville HS will attend Columbia (music or physics), Daniel Oshima from Buckingham Brown & Nicols (previously Prospect Hill Academy) and might attend Harvard (undecided), and Monica V E Thomas from Somerville HS will attend Tufts or U Penn or Cornell (mechanical engineering). 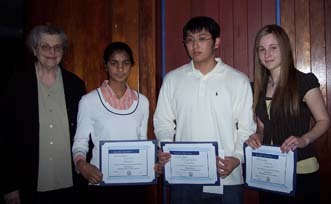 The finalists who received MathCad from MathSoft are David Bernal from Somerville HS will attend Daniel Webster College (aviation), Paula Andrea Bustos, from Somerville HS will attend Merrimack College (electrical engineering), Malessa Dias from Somerville HS will attend Harvard (biology & premed), and Natacha Lorius from Prospect Hill Academy will attend Wellesley College (premed). 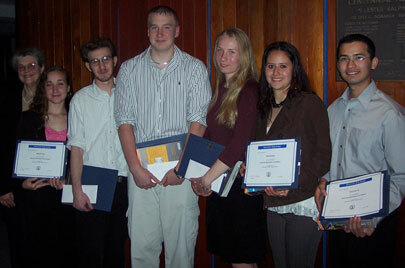 The winners received a scholarship and MathCad software. The winners were Matthew Boyle from Somerville HS. will attend Boston University, Malessa Dias from Somerville HS will attend Harvard University, and Bhaumika Shah from Somerville HS will attend Massachusetts College of Pharmacy / Parametric Technology of Needham. Picture on the left from left to right: Beth Porter from Parametrics, Bhaumika Shah, Matthew Boyle, and Erica Voolich, President of Somerville Math Fund Not pictured is Malessa Dias. The winners (receive scholarship and MathCad software) are Jessica Dias from Somerville HS will Harvard University, Tomas Fernandes is attending Suffolk University, Monica Shah from Somerville HS is attending Tufts University, and Yuan Hui Wu from Somerville HS is attending U of Mass, Amherst. Picture on the right from left to right: Monica Shah, Yuan Hui Wu, Jessica Dias, and Erica Voolich, President of Somerville Math Fund. Not pictured: Tomas Fernandes. 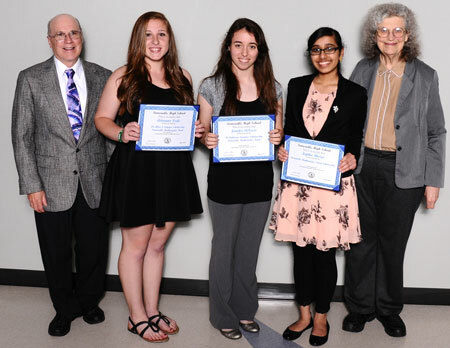 The winners (receive scholarship and MathCad software):At the Somerville High School's award night Erica Voolich, president of The Somerville Mathematics Fund, commented on the outstanding achievements of Prabesh Chalise, Kyler Evitt and Rebecca Wood-Spagnoli. At the Prospect Hill Academy awards ceremony, Voolich was joined by board member Jay Landers to recognize the outstanding work of Neha Sharma. All are planning on pursuing mathematics or a mathematics-related major in college. The Somerville Mathematics Fund is pleased to announce the winners of their renewable college mathematics scholarships. The selection committee was impressed with the quality of this year's applicants and pleased with the generosity of our donors who made it possible to give a record six scholarships. At the Somerville High School's award night Erica Voolich, president of The Somerville Mathematics Fund, commented on the outstanding achievements of Deepika Bhargo, Paulo Filipe Dourado, Nelson Moreira and Theodor Rich. Then at Buckingham, Brown and Nichols, Voolich recognized the outstanding work of Kathleen Oshima, followed a couple days later she went to Chapel Hill - Chauncy Hall to recognize the outstanding work of Robert Merrell. All are planning on pursuing mathematics or a mathematics-related major in college. Each scholarship is renewable for up to four years based on performance. The Somerville Mathematics Fund, an affiliate of the national scholarship organization Dollars for Scholars, was chartered in 2000 to celebrate and encourage achievement in mathematics in the city of Somerville, Massachusetts. Since it's founding, it has awarded $138,000 in mathematics scholarships to outstanding Somerville students. The winners of their renewable college mathematics scholarships. At the Somerville High School’s award night Erica Voolich, president of The Somerville Mathematics Fund, commented on the outstanding achievements of Maxwell Heath, Bipul Pyakuryal, Mirta Stantic, Jesse Stern, and John Thomas. 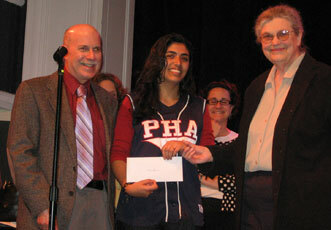 Ashleigh Thomas, a student at U Penn, is also a winner of one of the math scholarships. All have done outstanding work in mathematics and been involved beyond the classroom in science and math events as well as volunteering. All are planning on pursuing mathematics or a mathematics-related major in college. Erica Voolich (above) of The Somerville Mathematics Fund, congratulates John Thomas, Maxwell Heath, Bipul Pyakuryal, and Jesse Stern. The Somerville Math Fund was created in 2000 to celebrate and encourage mathematics achievement in Somerville and these winners’ mathematics achievements are definitely worth celebrating. This year’s winners are Zoe Blickenderfer, Nathaniel Dempkowski, Nathan Long, Felice Mancini, Michele Mei and Yongkang Yu. They are all planning to study mathematics or subjects using mathematics in college. Zoe Blickenderfer won the Alice T Schafer Scholarship. Dr. Schafer (1915 - 1909) was orphaned as an infant and raised by two aunts. When she went to college at the University of Richmond of Virginia, women students weren’t allowed in the library and she was discouraged from majoring in mathematics. She won prizes, earned a PhD, taught at colleges (including Wellesley) and among the things she is known for is helping start the Association for Women in Mathematics (1971). 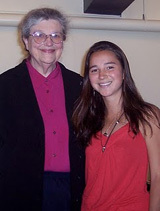 Less known about Dr. Schafer was her helping to start the Somerville Mathematics Fund in 2000 -- attending all of the planning meetings and contributing to their work as long as she was able. She is remembered for her passion and work to insure mathematical opportunities for women. 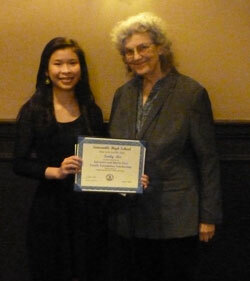 Yongkang Yu won the Lt. Catherine M Landers Scholarship. When Lt. Landers (1920 - 2012) wanted to go to nursing school (graduating in 1942), her grandmother opened a cedar chest were she had been saving dollar bills to help pay for her granddaughter’s education. Lt Landers won a Bronze Star for her service during WW2, where she ran a field hospital outside Paris. Lt Landers’ family donated a scholarship in her memory honoring her commitment to education. This year’s winners and their colleges are: Hae-Young C. Joo will attend U Mass Lowell, Emily Mei will attend U Mass Amherst, Nickolas Menezes will attend Rensselaer Polytechnic Institute, Rishab Sharma will attend Northeastern University, and Djinnie Timoleon will attend Hamilton College. 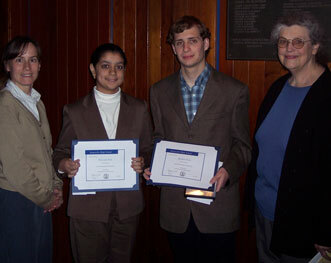 The all-volunteer Somerville Mathematics Fund is an affiliate of Dollars for Scholars. They offer renewable mathematics scholarships of $1,000 a year. Three of the students received named scholarships. Emily Mei (photo below on left) received the Salvatore and Maria Pizzi Memorial Scholarship. To read about the Pizzi couple whose family generously donated this scholarship go to Rishab Sharma received the Charlotte and Dr. Irving Fradkin Scholarship. You can read the story of Dr. Fradkin’s (and his wife Charlotte who worked behind the scenes to help make his dream possible) at http://scholarshipamerica.org/news_items/fradkin_history.php Dr. Fradkin was the founder of Dollars for Scholars over 50 years ago and just this April retired from Scholarship America, the parent organization. 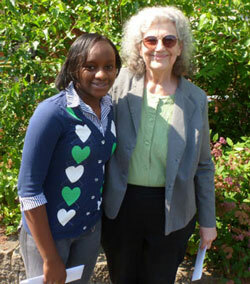 Djinnie Timoleon (photo on right below) received the Alice Schafer Memorial Scholarship. You can read the story of Alice Shafer at http://www-history.mcs.st-andrews.ac.uk/Obits2/Schafer_Boston.html Alice Schafer overcame challenges in her own life to become a mathematician and a founder of the Association for Women in Mathematics in 1971 and was their second President. She was a founding member of the Somerville Mathematics Fund board in 2000. The Somerville Mathematics Fund is pleased to announce the winners of their renewable mathematics scholarships for 2014. The Math Fund was founded to celebrate and encourage math achievement and these young women deserve to be celebrated for their work in math and science while in high school. Joytika Bhargo will attend Tufts University, Jennifer DiPersio will attend Stonehill College, and Adrianna Keefe will attend Fitchburg State University. Their scholarships of $1000 are renewable for up to a total of four years as long as they maintain a B average and take mathematics or courses which use mathematics. Two of the scholarships are given in memory of two outstanding women, Adrianna Keefe won the Alice T Schafer scholarship and Jennifer DiPersio won the Lt. Catherine M Landers scholarship. Adrianna Keefe won the Alice T Schafer Scholarship. She is planning to study mathematics education at Fitchbury State University. Dr. Schafer (1915 - 1909) was orphaned as an infant and raised by two aunts. When she went to college at the University of Richmond of Virginia, women students weren’t allowed in the library and she was discouraged from majoring in mathematics. She won prizes, earned a PhD, taught at colleges (including Wellesley) and among the things she is known for is helping start the Association for Women in Mathematics (1971). Less known about Dr. Schafer was her helping to start the Somerville Mathematics Fund in 2000 -- attending all of the planning meetings and contributing to their work as long as she was able. She is remembered for her passion and work to insure mathematical opportunities for women. Since Dr. Schafer was committed to the education and supporting women in mathematics, Adrianna becoming a math teacher is a wonderful way to honor Dr. Schafer's memory. Jennifer DiPersio won the Lt. Catherine M Landers Scholarship. She is planning on majoring in biology and psychology to eventually become a genetic counselor. When Lt. Landers (1920 - 2012) wanted to go to nursing school (graduating in 1942), her grandmother opened a cedar chest were she had been saving dollar bills to help pay for her granddaughter’s education. Lt Landers won a Bronze Star for her service during WW2, where she ran a field hospital outside Paris; she was about to be shipped to the far East when WW2 ended and so she boarded a transport ship for the USA instead. 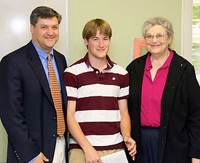 Jay Landers and Jasper Lawson donated a scholarship in her memory, honoring her commitment to education. Jennifer DiPersio's interested in genetic counseling is a wonderful way to honor Lt. Landers' commitment to nursing and education.